Brian and Stephanie teach permaculture and bio-regional methods of application. We can teach community based workshops at your property or for your organization. Choose an indoor classroom setting with slide show presentation, an outdoor hands-on workshop or a combination of both. We offer two hour lectures, day-long courses or a weekend workshop. If you have questions or would like to set up a workshop please fill out the form below. As part of our Fair Share, we volunteer our time with Earthshed Solutions, a local nonprofit organization. Earthshed Solutions’ mission is to promote ethical decision making and responsible stewardship of Earth’s resources. They focus on teaching and empowering people through their programs and projects to design regenerative systems for food production, soil fertility, energy efficiency and water conservation. Earthshed Solutions is a local 501(c)(3) nonprofit organization. Primarily an education organization there are several Programs and Projects which provide learning opportunities for the community. One such Education Program is the Earthshed PermaBlitz. 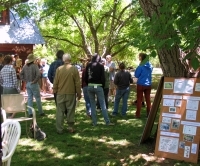 The Chico Permaculture Guild (CPG) is an Education Program of Earthshed Solutions. Gatherings are held several times per year and are free and open to the public. The CPG was formed in 2009 by a small group of permaculture designers whose aim was to gather like minded people together to learn and practice permaculture. The primary objective of the Chico Permaculture Guild is to facilitate the outreach of permaculture education at NO COST placing permaculture knowledge and skills directly into the hands of our community. Chico Seed Lending Library (CSLL) is a local seed library in operation since 2013 serving Butte County residents. CSLL is a Partnership Program with the Butte County Library, GRUB Education Program and Earthshed Solutions. CSLL is located within the Butte County Library, Chico Branch. CSLL hosts monthly 'Lettuce Get Together' events, check out the schedule. CSLL is a self-perpetuating collection of seeds donated and shared by members of the general public, with the purpose of educating users about seed saving and gardening, preserving genetic diversity in Butte County, developing locally-resilient plants, and strengthening the public library’s place at the center of our community. CSLL also receives generous donations from regional seed companies.